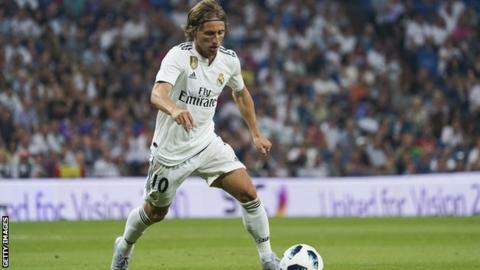 Inter Milan will face no action over Real Madrid's allegation they made an illegal approach for midfielder Luka Modric this summer, Fifa has decided. Modric, who joined Real from Tottenham in 2012, was linked with a move to Italy after helping Croatia reach the World Cup final in Russia in July. It was reported that Inter made contact with Modric's agent in early August. Madrid made a complaint to Fifa, but after examining the evidence, the governing body has closed the case. Fifa's transfer rules state no club can approach a player without first receiving permission from their club, unless they are in the final six months of their contract. In 2016 Modric, 32, signed a four-year deal with Madrid. A Fifa spokesperson told BBC Sport: "After having conducted a preliminary investigation into the matter, we can confirm that based on the evidence at hand, no disciplinary proceedings will be opened. "This has been duly informed to the respective clubs." Modric was named player of the tournament at the World Cup, where his side lost 4-2 to France after reaching the final for the first time. His international team-mates winger Ivan Perisic, 29, and midfielder Marcelo Brozovic, 25, were joined by Sime Vrsaljko, 26, at Inter this summer, with the defender signing on loan from Atletico Madrid. Responding to reports linking Modric to Inter in August, Madrid president Florentino Perez said the only way the midfielder would leave was if his 750m-euro (£675m) release clause was met. Modric has made four appearances for the European champions this season, making his first start of the new campaign in Saturday's 4-1 victory at home to Leganes.